It has come to my attention (through running around like a mad woman and having twenty-nine pieces of paper in my purse) that I need one of those planner thingies. I currently have a little notepad, blank index cards, post-it notes and pieces of ripped paper. This method is not working! “I know I wrote that down,” I say as I rummage through my larger than necessary purse, filled with lots of stuff I do not need. Ok, I think that is it! I need one of those little day planner thingies.. but not so much a calendar, but one to write other stuff down. Maybe it has pockets or something for my little papers. I also think I need to trade in my large (very pretty) Maize colored purse for a much smaller some other color purse. 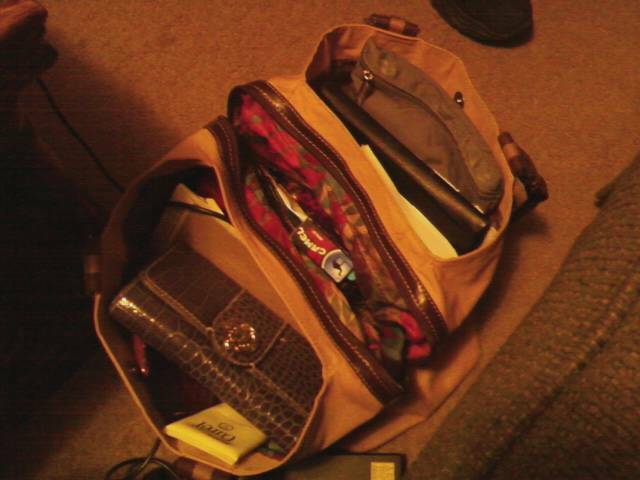 I downsized my purse so that I was limited to the amount of stuff I can actually carry around with me. Then, I had to upgrade to carry/fit my Nook. But, (amazingly) my clutter level has remained relavtively low. This post may just be an excuse to talk myself into going to Marshall’s for a new super keen purse. I am in purse heaven right now! I love big purses with lots of stuff. I wasn’t much into big purses until my sponsor accidentally spilled an entire cup of Starbucks coffee into my very modest black purse. One of the exercises I did in a creative writing course I once did was write out the contents of the bag/handbag/pocket of the character I was creating. Am soooo tempted to write a story about you :). happy to have met you via twitter! Hey there.. thank you so much for stopping by.. 😀 That sounds like a very interesting exercise! *blushing* a story? about me? Am heading over to the Rule of Three Writers’ Blogfest to check it out. Buzzzed to discover your blog via Twitter.